The lifetime risks of developing and dying from certain cancers for men and women according to the US National Cancer Institute’s Surveillance Epidemiology and End Results (SEER) Database, which is based on incidence and mortality data for the United States for the most current years for which data are available. For a man it is 43.31% or 1 in 2 will develop cancer. For a woman it is 37.81% or 1 in 3 will develop cancer. What this means is you have a good chance that cancer will knock on your door sometime in your life but when it does will you be ready? It is always better to be proactive in your life instead of reactive. This is especially true with a cancer diagnosis. So many of the patients we have seen over the last 32 years at Total Health Institute come in to restore their health after such a devastating diagnosis. The words we hear all too often are these “I was shocked, blown away, completely caught off guard, had no idea, could not believe that this could happen to me”. Our answer is simple. You live in a toxic environment, toxic air, toxic water and toxic food. You add breaking the 7 Basic Steps to Total Health daily in the mix along with higher than normal stress for prolonged periods of time and the outcome is cancer stem cell production which is the base cancer cell that makes all the other cancer cells. How many people are going to get diagnosed with cancer? We already stated the SEER statistics that if you are a man 1 out of 2 and if you are a woman 1 out of 3. Why do we keep saying this? Are we trying to scare you? Are we speaking a doom and gloom message? No. What we are trying to do is get you proactive so you get healthy, really healthy, beyond what you could ever imagine healthy right now instead of when you get diagnosed with cancer, not when you feel really sick like you might get cancer but right not so you can enjoy life to the full and have energy and vitality from this year forward. What if we told you there was a way to prevent cancer and all disease, feel full of energy from the time you wake up in the morning until the time you go to sleep in the evening (without sugar or caffeine added), go to your ideal body weight without going on a diet, look and feel at least 10 years younger, have no pain in your body, have a clear mind and a great memory, be stress resistant meaning you are the calm in the midst of any storm, and most importantly you could grow in your relationship with God so you could hear His voice much clearer? You are thinking this sounds too good to be true or which products can I buy to achieve this? It is true and you can achieve all of this but it does not come in a bottle or from a product and you cannot buy it but you can learn the steps to attain it and progressively take those steps until they are yours and you own your health. Is it easy? No otherwise everyone would have it. Is it easy to go to the Olympics? No otherwise everyone would be there. Narrow is the road that leads to LIFE and FEW will find it. Why will only a few find it? Because only a few are willing to make the sacrifices necessary to walk the road that leads to LIFE and total health of body, mind and spirit. Did God design us to walk this path? Absolutely, He came so that we would have the abundant life, the prosperous life, so that we could live life to the fullest. We call this life- total health of body, mind and spirit. The journey of a thousand miles begins with the first step and for some it might be a baby step but that doesn’t matter as long as you keep moving forward you will eventually get to your destination. But you have to take the steps no matter how small and keep taking those steps each and every day. Faith without action steps is dead meaning you will not receive or achieve what has been given to you if you do not keep moving in the direction God has put into your heart. Get knowledge– watch this video so you know how cancer works so you are proactive and never have to wait for it to knock on your door or if you already have cancer you know how you can become healthy so cancer does not want to live in you anymore. 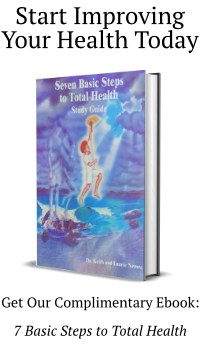 Download our complementary 7 Basic Steps to Total Health ebook on our homepage (upper right section) so you can start taking your first steps in your journey. If you do not act you cannot receive what has already been given to you. If you do not move you cannot achieve the destiny that is rightfully yours. If you have been diagnosed with a major health challenge and would like some guidance call Total Health Institute at 630-871-0000 and let them know you received the “What to do if you ever get diagnosed with cancer” email and wanted to set up a complementary phone consultation. An ounce of prevention is worth so much more than a pound of cure. It is up to you to choose life and blessings otherwise you will default into death and curses.